Here are some 100% exclusive photos of Sachin Tendulkar with his beautiful wife Anjali Tendulkar taken at Wimbledon’s Royal Box today during the semi-final of Wimbledon 2012 between Roger Federer & Novak Djokovic on 5th July, 2012 .. So, finally Nike Tennis have announced the official dress for Roger Federer for the London Olympics starting later this month. As you all know, Wimbledon championships have a white colored protocol or call it dress code for all players. But, thankfully, for Olympics, there won’t be any such protocol & players are free to wear colors chosen by them or their respective associations. As you all know, this red color has been chosen as we all know, that the official color of Swiss flag is red, so this shirt has been designed & I’m sure, Roger Federer will look awesome in it. As all of you are aware that Wimbledon championships are starting from 25th June, 2012. There is no denying of the fact, that Wimbledon is no doubt the most followed Grand slam of all the four slams. Novak Djokovic will be defending his Wimbledon title & also, he became no. 1 in 2011 by winning the Wimbledon 2011. So, he has to defend not just the title but also, complete one full year at Number. 1. Rafael Nadal will be trying for his third Wimbledon title & if he manages to win Wimbledon,he has a chance to get to No. 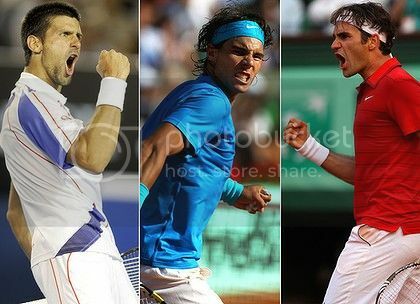 1, also, he will become the first ever man in the history of Tennis to do the “Old World Triple” twice in his career. Old world triple means winning titles at Rome, Paris & London. Roger Federer will be trying for his 17th Grand slam & his 7th Wimbedon & a chance to regain No. 1. Andy Murray too will be trying for his 1st ever Grand slam. Can Novak Djokovic retain No. 1 ranking after Wimbledon 2012? Can Rafael Nadal regain No. 1 ranking after Wimbledon 2012? How can Roger Federer regain No. 1 ranking after Wimbledon 2012? How far can Andy Murray go if he wins Wimbledon 2012? Watch out for a PDF made by me, I can guarantee you that after seeing that, you too will be an expert in ATP rankings. As you all are aware that Nike is the sponsor of Roger Federer’s outfits. So, a few days back, Nike announced the dress of Roger Federer for AELTC, Wimbledon 2012, London…. In this article, I will be explaining the ATP ranking points scenarios after French Open 2012. So, as you can see, the battle for No 1 is still more or less between the Top 3 & with Andy Murray already out from the semi finals race, the Top 3 are the players to watch out for …. Keep reading the article on our tennis site here ————- (also, has a comprehensive discussion how will Roger Federer regain No. 2 ranking from Rafael Nadal post French Open, 2012). Every one in the universe knows that Roger Federer is a very calm & composed person & a great person. But, yes, please don’t ever forget that he too is a human like all of us. So, during the second set tie breaker, when some one in the crowd called a shot of his out (when the ball was clearly in), he too got angry & after the point yelled Shut Up.